Edited by Reuben Gold Thwaites. Hardbound, 328 pages, 6" x 9". This collection contains four of the most important journals of recorded travel into Indian country during theformative period of early Western settlement. Originally published in 1904. Conrad Weiser's journal records the first official journey into the Indian country undertaken at the insistance of the English colonies in August and September of 1748. The journals of George Croghan (1750-1765) are an epitome of the Indian history of the time. 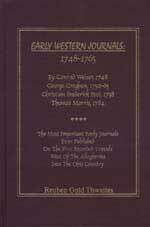 The journals of Christian Frederick Post cover the months of July to September, 1758 when he was sent out on an expedition into the neighborhood of Fort DuQuesne; and October, 1758 to January, 1759 as he carried news of the treaty of Easton and paved the way for General Forbes's advance. Captain Thomas Morris accompanied Bradstreet (1764) on his expedition to Detroit. His journal presents one of the most thrilling episodes in early western history.